With just a few simple ingredients, these Easy Enchiladas come together in no time and are packed with flavor! Add some sour cream and avocados to the top (if desired), and you have a meal everyone will be requesting seconds on! A few weeks ago, I was seriously in the mood for Taco Tuesday. 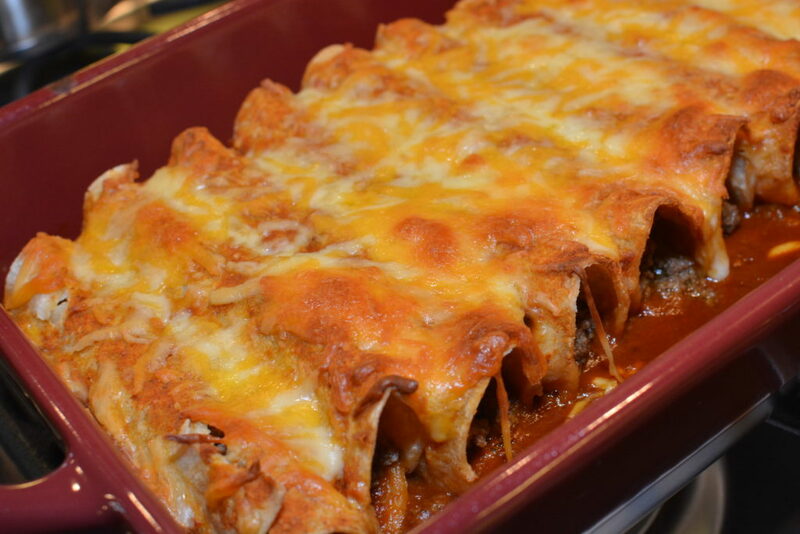 Since our evening was booked up however, and I didn’t have a few of my favorite toppings for tacos, I decided to make enchiladas. Both are my fav, so I knew it would satisfy my craving! I had the pan fully prepared in under 15 minutes! The best part, it was using ingredients I already had in my pantry which meant no last minute trip to the grocery store for me! I prepped these in the early afternoon and once the kitchen was cleaned back up, moved on with my day! Come dinnertime, I removed the pan from the refrigerator and popped it in the oven! Not only did the hubby and myself enjoy these, but all three of my kids asked for seconds! My hubby took the leftovers for lunch the next day, which of course, always shows just how much he enjoyed the dinner! Tortillas! I used corn because my family LOVES the flavor, however, if you prefer flour…..feel free to substitute. Flour seem to hold up a bit better over corn. If using corn, make sure you microwave the tortillas for a few seconds before stuffing. Go in batches so they don’t cool off either. Being warmed a bit helps them not to tear as you are rolling them up! Enchilada sauce! Yes, I cheated and bought store bought which is what is listed below. But, I have also included a fabulous homemade sauce you can make in place of the canned. I was short on time and know how those busy nights can be, so whether you want to try canned or homemade, I promise you’ll love these!! Click here to see the homemade sauce I have used in the past and loved! Toppings: The recipe calls for just adding cheese on top. I however, love me some sour cream, so feel free to dollop (or plop, hehe) as much as desired. Perhaps some diced avocados and tomatoes as well? The possibilities are endless!! Taco Seasoning: As you’ll notice in the recipe, I use a few tablespoons of this. You can use the store packet, which you’ll use the entire packet….OR, you can try my homemade version and keep it on hand for future recipes as well! What to serve with it: Well, of course, I am a rice and beans kind of gal, so click here to see my go to Mexican rice recipe and click here to see my Refried bean recipe! That’s it! 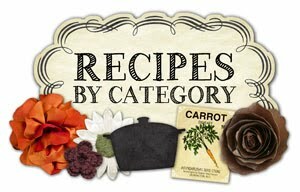 Now you are set with a few of my tips….onto the recipe we go! Scroll below and enjoy! Be sure to let me know how it turns out and what you think! 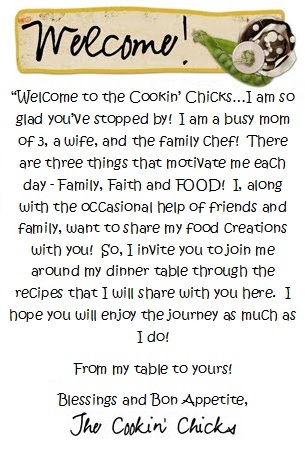 If you are on Instagram, take a pic of your dinner with the #thecookinchicks. I love seeing your creations and who knows, may even feature your pic!! 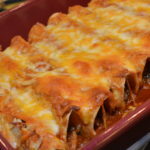 Using a few shortbuts, these Easy Enchiladas come together in no time but surely don't skimp on flavor!! Preheat oven to 375 degrees and spray a 9x13 baking pan with spray. In a medium skillet, cook beef over medium high heat until no longer pink. Drain fat and stir in the taco seasoning and green chiles. 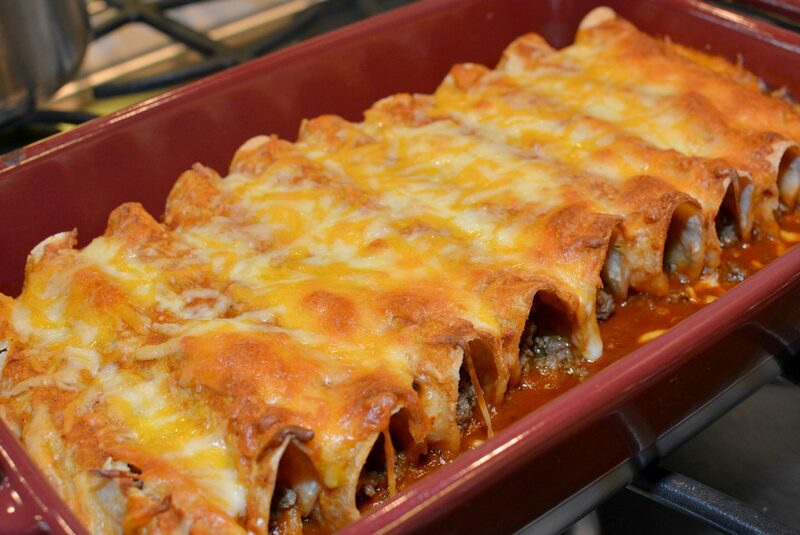 Spread 1/2 cup enchilada sauce on bottom of prepared baking pan. Scoop about 1/4 cup beef mixture and place into the middle of each tortilla. Sprinkle some cheese (about 2 tbsp) on top of beef mixture. 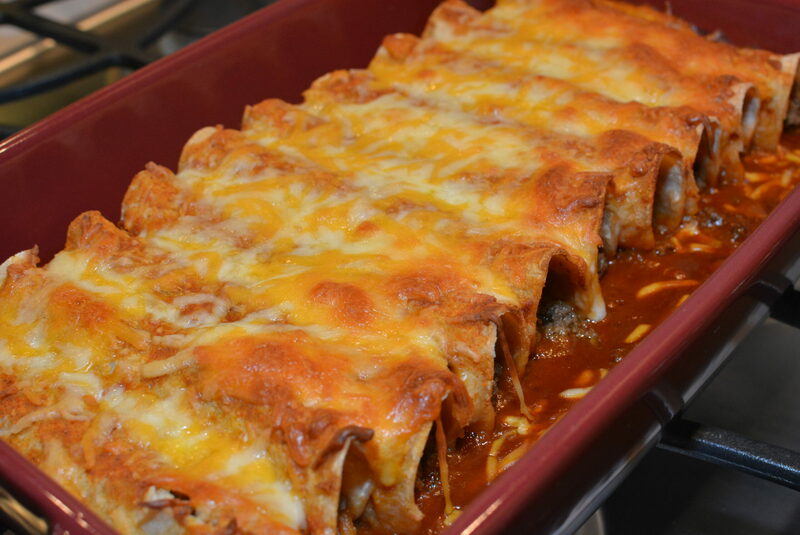 Carefully roll the enchilada up and place seam side down into prepared pan. Continue process until beef mixture is gone and tortillas are stuffed into pan. Pour remaining enchilada sauce evenly on top of wrapped tortillas followed by remaining cheese. Place pan in oven and bake for about 20-25 minutes. Tried these today. BIG SUCCESS! Loved the recipe for the taco seasoning. I had everything but the cumin. I prepared them, then put them in the refrigerator for about an hour. It was time to get ready for the Super Bowl. And I wanted to cook them during the pregame. I took pictures and sent to my Sisters in TN (I’m in AZ). They are now anxious to try it. They said if I can do it they can too. I haven’t had too much success with cooking and this was a big WIN for me. My Boyfriend was thrilled. YEA!!! That’s great news! So glad to hear you enjoyed it! Be sure to let me know if your sisters try it too! !